Andela, a startup that trains developers in Africa and hires them out to global tech companies, has raised $40 million in Series C funding. The financing came from CRE Venture Capital, a pan-African venture firm, with additional participation from DBL Partners, Amplo, Salesforce Ventures, and Africa-focused TLcom Capital. Previous investors, including the Chan Zuckerberg Initiative, GV, and Spark Capital, also joined in funding what is now one of the most highly funded African company not based in Africa. Andela says it will use the money to fund aggressive expansion plans — including the launch of two additional offices in other African countries. But the financing comes as some local entrepreneurs have told us they worry about Andela taking money and attention away from other startups which are actually based on the ground in the continent. The company was launched in 2014 to train African software developers and place them in jobs at some of the world’s top technology firms. The idea was to take an underutilized talent pool to help alleviate a global shortage of software developers. As the company notes, roughly 1.3 million software jobs went unfilled in the U.S. in 2016 alone. 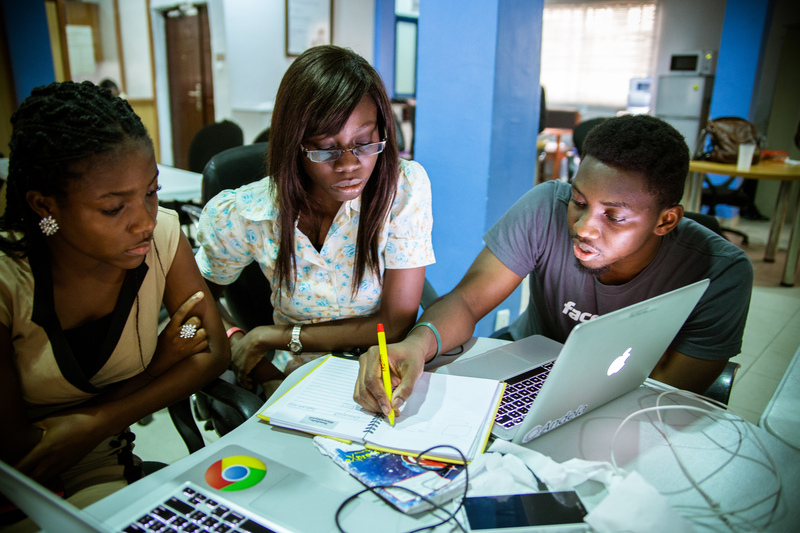 Andela has built up campuses in Lagos, Nigeria, Nairobi, Kenya and Kampala, Uganda to train coders and then put them to work on projects for companies such as Mastercard Labs, Viacom, GitHub, and Gusto. To date, the company has hired 500 developers — which it calls the 0.7% — from its applicant pool of more than 70,000 candidates. Andela pays its employees a minimal salary for the first six months after they join but gives them each a laptop, provides subsidized housing, and offers two meals per-day. That’s in addition to technical and professional skills development, leadership training, and mentorship. The company says it invests $15,000 in each developer during this period. After the six months, once developers are promoted and begin client work, Andela says it pays a salary that is competitive within their local tech ecosystem. That goes up to around $2,500/pm in Lagos and around $3,000/pm in Nairobi. Andela co-founder Jeremy Johnson calls the business a “mission-driven, for-profit company”. Indeed, he says Andela has “become a poster-child for that — that you can actually build businesses that create real impact”. A slew of U.S. tech titans from Mark Zuckerberg to Steve Case have praised the company for just that but the feeling from some local African entrepreneurs is that Andela may actually be slowing the pace of the tech industry’s development on the continent. They argue it is taking badly needed tech talent away from the local ecosystem just as it’s getting started. To further head off the criticism that’s coming from more than a few corners of the African tech world, Andela is touting its partnerships with organizations like Google and Pluralsight to provide mentorship to developers — and also the open sourcing of its curriculum. The company says the skills it provides to developers working at global companies will also make them better leaders of their local tech communities when they finish their two-year contracts. Johnson is right but the African technologists that he speaks of are launching their companies right now. Witness startups such as Pagatech and Jumia that could be, or already are, billion dollar businesses that started locally. Competition to the Andela model is also coming in the form of the Moringa School, which places developers in local tech companies after they complete their training.